Decorative pillows offer a way to dress up and add more style to any room. From your living room and family room to your bedroom, decorate your furniture with store-bought and custom-made decorative pillows. While it's easy to overlook, you must clean your decorative pillows regularly to remove dirt, oils and dust, which can accumulate over time and change the look, weight and shape of your decorative pillows. Wash your decorative pillows with care. Spot clean light stains. Wet a microfiber cloth in a bowl of soapy water. 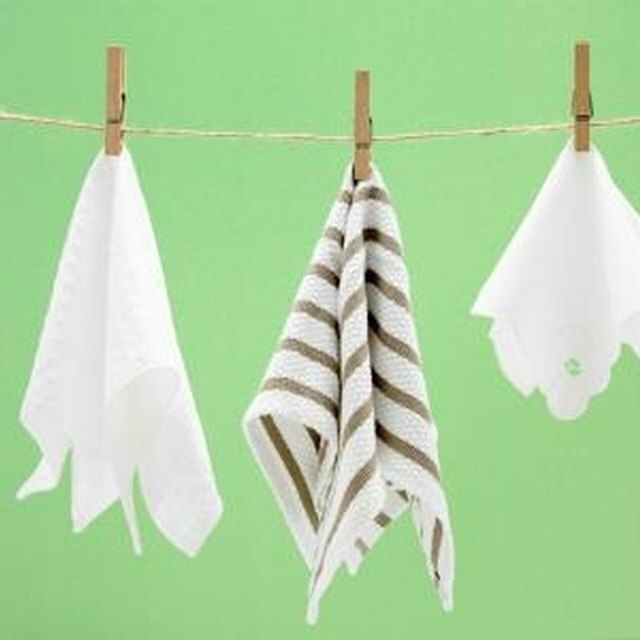 Wring excess water from the cloth and blot light stains, especially those that are new. Place the decorative pillow inside the washing machine. Add a mild detergent and select a hot/cold setting. When washing more than one decorative pillow, space the pillows at an even distance inside the washing machine to prevent a jam. Select the gentle cycle. Wash removable pillows separate from their cases. Wash the case with similar colors and adhere to the washing instructions. Protect elaborate stitching by sending decorative pillows with elaborate embellishments to the dry cleaners. Dry the decorative pillow in the dryer to restore the shape and stave off mold. For down and feathers, use the air cycle. For synthetics, opt for a low-heat setting to avoid clumping. Wrap three tennis balls in a sock and add them to the dryer cycle to improve shaping and ensure fluff and bounce is restored. When washing a decorative pillow, adhere to the manufacturer's instructions, especially warnings such as "dry clean only." Can You Machine Wash Dry-Clean-Only Drapes?